We regard the Ibibio as the first ever made by God, therefore they know more than other races of ancient knowledge concerning the making of the world, the coming of the first man and the secrets of the gods. The population of Ikot Abasi LGA is grouped into five Ibibio clans. The Ibibio are regarded as the oldest group in southern Nigeria and their legends and myths tell only of short people with tails, Nnung Amama Isim - who were probably earlier Khoisan inhabitants of the region, whom the Ibibio probably drove away into Equatorial/Southern Africa. Ibibio language is grouped, together with the related Eastern Obolo language, in the Cross River sub-group of the Benue-Congo group of the Niger-Congo family (Essien, 1995). Historical records point to probable outside contacts among others with Phoenician navigators (around 600BC), Norman sailors (around AD1410) and early Portuguese traders (Jeffreys 1935: 1-4; Talbot, 1926, 1: 185). By the era of intensive slave trade on the West African coast, the Ibibio, who were a slave supply source, were well-known to Dutch and English traders like Dapper (1668 to 1688), Barbot (1698-1699), Captain Crow (1795-1808) and Captain Adams (1786-1800) as Moko (Mbogo, Mogo, Moco) and Quaws or Kwa (Jeffreys, 1935: 5-9; Talbot, Ibid. ; Abasiattai, 1991). The people of Ikpa and Ukpum are of two different Ibibio clans, which constitute a greater part of Ikot Abasi Local Government Area today. In the early days of their settlement in the area, they formed the two major power blocks, with the Ukpum driving a wedge between the eastern Ikpa (now in Mkpat Enin Local Government Area) and the ones in the east of Ikot Abasi area. The conflicts between these two groups were often occasioned by their desire to expand their frontiers. In one of the wars between Ikpa Nnung Assang and Ukpum Okon, supported by Ukpum Minya warriors, the outcome was in favour of Ikpa Nnung Assang (Essene). However, to forestall subsequent confrontations between the two neighbours, i. e. the Ikpa and the Ukpum, an understanding was reached and the present boundary between Ikpa Nnung Assang (Essene) and Ukpum Okon/Minya was established. A few of the canons, used in the war by the Nnung Assang people, can still be found in Essene Town. The territorial expansion embarked upon by each clan, often at the expense of other clans, brought the clans into constant conflicts. Inter-Clan wars were, therefore, common (Ufot, 1985: 30-36). Until their contacts with the Europeans, which enabled them to acquire some fire arms, their main weapons of war were sticks, spears, bows and arrows. No clan also had a standing army. Accordingly, a force of able-bodied men was often hurriedly raised in times of war. The men so recruited were tested for fitness by the priests of the traditional religion. Those who passed the test underwent some vigorous physical training and protection rituals before they were sent to the battle field. War had a definite code of conduct and rules governing the declaration of war, time and place of battle, truce, peace-making and intermediaries' immunity, security of women, children, crops and water sources (Ekong, 1983: 52-54). War captives were sold into slavery, or sacrificed to the gods, or made servants to the chiefs. All war booties were shared among the elders and the fighting men. And any warrior who brought back a human head from the battle field, as a symbol of his courage, was greeted with great honour (Ibid.) and was entitled to special burial rites and a memorial shrine after his death. Even though the clans fight against one another, they generally maintained friendly relations among themselves. Inter-clan marriage, for instance, was practised. People of different clans also exchanged gifts and ideas and often named their children after their friends outside their clans (Ibid.). 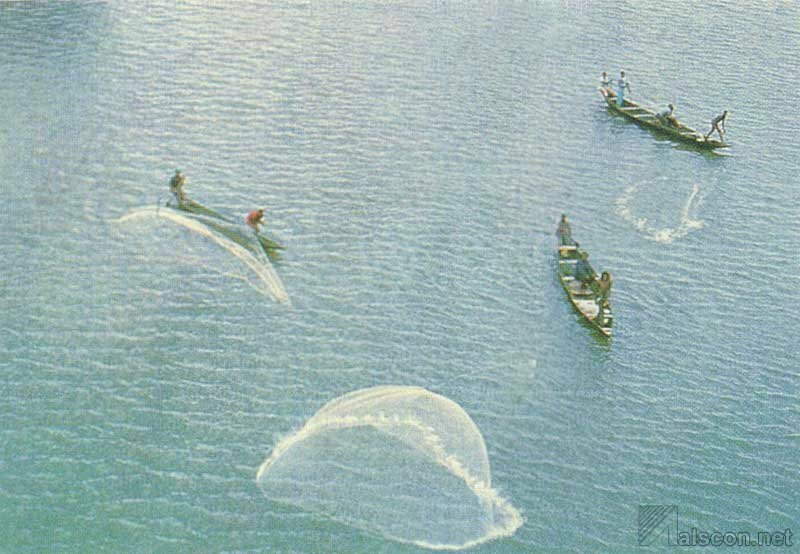 Fishermen casting their netsThe pre-colonial Ikot Abasi people also engaged in a wide range of economic activities, notably, agriculture, fishing, hunting, craft/industry and trade (see Physical Features and Natural Resources). Agriculture was particularly important in the area because of available fertile and excellent land for the cultivation of palm trees and food crops. Farming was carried out by both men and women and the major crops cultivated included yams and vegetables (Ina, 1989: 19). Fishing was another popular occupation in the area and was often combined with farming. The fish caught included mullet: grandisquamis, tilapia: malatica and chrysichthys waiter (Ejituwu, 1991: 49). Hunting was also popular and widespread. It could be done by one person. But, generally, it was carried out in groups of three or more people. The animals hunted included deer, grasscutter, antelope and leopard (Ekong, 1983: 62). Of all the animals, leopards were probably the most dreaded. To many people they were synonymous with enemies and their killing was therefore regarded as a community service. Since the capture and killing of a leopard involved a high degree of skill and courage, it became a symbol of bravery. The leopard's carcass provided an important source of meat while its skin served as a symbol of authority and the wearing of it conferred power on the wearer (Ejituwu, 1991: 50). It was probably the importance attached to leopards in the society that gave rise to the formation of Man Leopard Society (Ekpe Owo) and its menace in Opobo Division in the 1940's. A merchant ship cast anchor on a strange shore, the merchants went on land, laid out their presents and retreated to show their friendly intentions. After sometime the natives appeared, set out their exchange presents and disappeared so as not to scare away the other party. Then the merchants returned and examined the goods laid out. If they approved, they took them away and left their own ones behind. If not, they took some of their presents away and thus made a new offer. This game went on until the offers on both sides were balanced and everyone was satisfied, and thus transaction concluded. The first Europeans with whom the people of Ikot Abasi established contacts were the Portuguese. These were mostly traders and a few Christian missionaries. In their exploration of the West Coast of Africa in search of gold, Christian allies including the legendary Christian King, Prester John, the sea route to India and further knowledge of geography (Crowder, 1966: 67), the Portuguese came into contact with the Andoni probably in 1472 (Ejituwu, 1991: 66) and by the sixteenth century they had also begun slave trading in Calabar (Isichei, 1976: 42). Within a few years after their arrival on the coast, the inhabitants of the Ikot Abasi area committed themselves to the Atlantic trade with the Portuguese through the Andoni middlemen. Slave shacklesIndeed, it was through the slave trade, and not missionary work, that the Portuguese established their influence in the area. The Christian missionaries tried to plant Christianity in Andoni area in the 16th century. But the faith had no root and so disappeared from the area by the end of the 17th century. It was not until the early years of the 20th century that it reappeared and got established (Ejituwu, 1991: 89). Slave trade, on the other hand, persisted. It flourished in Ikot Abasi and other parts of Nigeria even after the Portuguese had been replaced by the Dutch, the English, the French and other slave traders from Western Europe and the Americas. By the eighteenth century, Britain had become the leading slave trading nation in the world. Slave trade, it should be noted, was not a Portuguese innovation; it preceded the arrival of the Portuguese in the area. The Andoni, for instance, bought slaves from their hinterland trading partners for use as labourers and other economic pursuits or for incorporation as wives (Ibid.). With the arrival of the Portuguese, the Andoni bought slaves not only for their private use, but also for sale to the newcomers. The Andoni thus became the first middlemen in the trade between the Ikot Abasi people and the Europeans. They were later replaced by the Umani (Bonny) and the Aro, who became dominant in the trade, and remained so up to the middle of the 19th century (Jeffreys, 1935: 1). Those sold as slaves, as in the pre-Portuguese era, included war prisoners, debtors, breakers of taboos, persons convicted for murder, adultery, and so on (Waddell, 1863: 929; Ita, 1983: 7). As the trade with the Europeans called for more slaves, the Andoni, Umani and Aro middlemen traders and their hinterland partners supplanted their limited sources by battering upon strangers living in their midst. They also started to raid nearby communities (Ina, 1989: 54). Once started, slave trade continued unabated despite strong opposition by the humanitarians and abolitionists. Eventually, the Industrial Revolution of the 18th century, the spread in the same century of new ideas in Europe such as the French Revolutionary ideas of Liberty, Equality and Fraternity and Thomas Paine's Rights of Man and political and strategic considerations, among other things, rendered slave trade obsolete. Consequently, Britain abolished her own slave trade in 1807 and then worked relentlessly for the abolition of the slave trade of other nations (Isichei, 1982:149). With the abolition of slave trade, Britain also turned her attention to the trade in palm produce and forest products. Ikot Abasi had been noted for its rich production of large quantities of palm oil in the hinterland. Attracted by this and the prospects of Egwanga/Opobo as an important sea port, British, French and German firms established their factories on the river estuary, some of them moving in from Bonny. These included Mclver, Miller Brothers, Thomas Harrison, Stewart and Douglas Hutton and Cookson (Jaja 1991: 4). By July 1882, Consul Livingstone reported five great English firms doing immense trade in the Opobo River (Livingstone, 1882). 1. Couper Johnstone and Company of Glasgow. 2. Thomas Harrison and Co. of Liverpool. 3. Hatton and Cookson of Liverpool. 4. Richard and William King of Bristol. 5. Stuart and Douglas Ltd. of Liverpool. 6. Taylor; Laughland and Co. of Glasgow. 7. George Watts of Liverpool. The firms bought and exported palm produce and forest products and imported manufactured European goods for sale to the local people. Manilla was the major currency used in the trade transaction. Sometimes, European goods were sold to African middlemen or given to them in trust (Udoessien, 1987: 21). The trust system enabled the African middlemen to collect European goods on credit. And after selling them, they paid back to the companies the agreed amount. An important factor in the development of trade in Ikot Abasi and an incident that led to the establishment of Opobo District, was the establishment of the trading state of Opobo by Jaja (Crowder, 1966: 179). Jaja, regarded universally as an Igbo slave sold to King Opubo of Anna Pepple (Canoe) House in Bonny and later head of that house and founder of Opobo Town, was probably an Ibibio man. Sir Udo Udoma asserts that the late Chief Ntuen Ibok of Essene insisted that Jaja was an Ibibio man, born at Minya in Ikot Abasi area to one Etuk Ufi (Udoma, 15/4/96). At birth, Jaja was given the name, Akpan, and thus became known as Akpan Etuk Ufi. As he grew up, he became sportive and restless, and people gave him the nickname, Yoyo. Soon, the name Yoyo eclipsed his parental name, Akpan. And since he was also insubordinate, troublesome and aggressive, his father sold him to an Igbo slave trader from Nkwere who, after experiencing for some time his mischief, resold him to King Opubo of Bonny. At Bonny, his nickname, Yoyo, was corrupted to Jojo and then to Jaja, probably by European traders. Applying his energies to trade, Jaja became a prosperous trader and subsequently, head of Anna Pepple Canoe House and a leader of one of the Bonny war factions. Fleeing from the civil war in Bonny in 1869, he founded the town of Opubo, corrupted to Opobo (Udoma, 15/4/96). It is difficult for us to accept or reject Chief Ntuen Ibok's story about Jaja's connection with the Ibibio people. Perhaps, in support of the account, it can be accepted that the name Jaja is probably a corruption of the Ibibio name, Yoyo. For one thing, the name of his Igbo father is unknown. Again, the fact that Jaja, after leaving Bonny moved eastwards to establish his settlement in an area later claimed by the Ibibio as their land, is an indication that he was well familiar with the place and hoped to gain active support from his Ibibio kinsmen. The assistance, later given by the Ibibio to the Opobo in their dispute with the Andoni over the ownership of the Island in 1927, goes further to uphold Jaja's alleged Ibibio ancestry. Nevertheless, further research is needed to establish the truth of the matter. 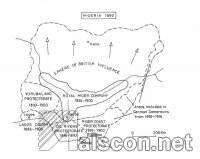 British Protectorates in Nigeria (Source: Nig. 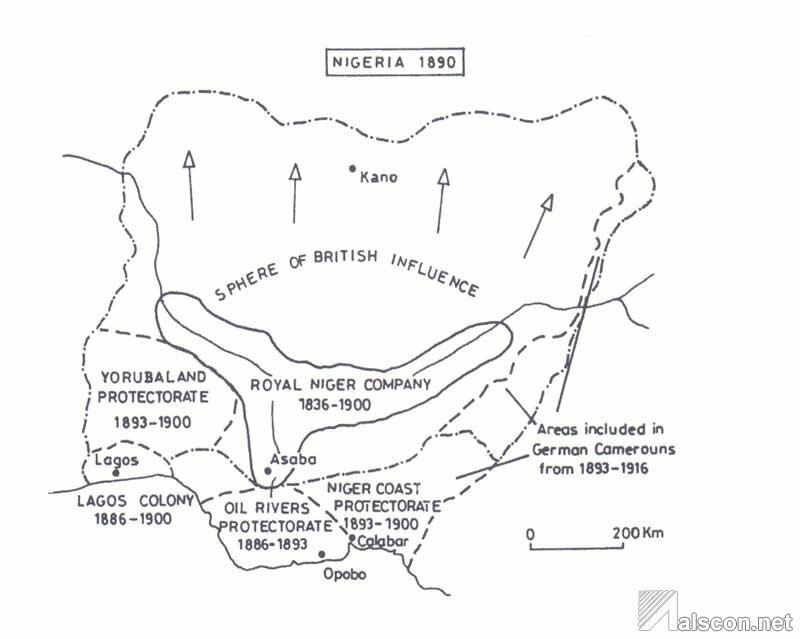 Historical Atlas)The Jaja episode marked the beginning of the gradual dismantling of the sovereignty of the people and rulers of Southern Nigeria. The field, says Ikime, was now left for British economic and political manoeuvres (Ikime, 1981: 158). Before Jaja's exile, the Niger Company had, in 1886, received a Royal Charter and become the Royal Niger Company. The Company took over from the Niger District Protectorate the corridor from the mouth of the Niger to the confluence as well as the territories on both banks of the Benue (Ejituwu, 1991: 158). In 1889, the remaining area under the protectorate, after the excision was renamed the Oil Rivers Protectorate with headquarters located at Calabar (Afigbo, 1972: 320). Acquisition of territories in Africa was now regarded in official circles as indispensable to British prosperity, employment and prestige as a world power (Uzoigwe, 1975: 25). In 1891, Sir Claude Maxwell MacDonald was appointed Commissioner and Consul-General for the Oil Rivers Protectorate. He was instructed to develop trade, promote civilisation and pave the way for placing the territories over which Her Majesty's Protectorate is and may be extended directly under British rule (MacDonald, 1895). In the foregoing analysis, it has been shown that long before contact with Europeans in the 15th century, the people of Ikot Abasi had developed a viable economic system based on trade in the products of their economic activities in their local and distant markets. Through this they were able to establish contacts and good relations with their neighbouring and distant trade partners. Contacts with European slave traders in the second half of the 15th century inaugurated a change in the pattern of trade. Slaves from Ibibioland were sold to Europeans on the coast through the Andoni, Umani and Aro middlemen. The slave trade itself diverted people's attention from their legitimate occupations and through the influx of non indigenous slave traders, altered the ethnic composition of Ikot Abasi area. The Andoni, Umani and Igbo had now moved into the area with the Ibibio. Furthermore, the hitherto peaceful society became unstable and insecure. The trade in palm produce, which replaced slave trade, also had far reaching consequences. It led to the establishment of British informal hegemony, through British Consuls and traders between 1850 and 1884, and conquest and colonisation in the last decade of the 19th century. The establishment of the Vice-Consulate District with headquarters at Norah Beach formally created the Opobo District comprising Opobo Town, Ikot Abasi and the surrounding areas. By the second decade of the 20th century, Andoni and Ogoni had been conquered and brought into the district. During the period 1892 to 1900, some European firms moved to Egwanga, which became the administrative headquarters of the District in 1902.